Laap Ton Yang Restaurant (ร้านลาบต้นยาง) is a Northern Thai restaurant in Chiang Mai that specializes in chopped meat salad, known as laap (ลาบ). There’s no need to brag about the masterful Northern-Thai style chopped meat salad recipes they’re perfecting inside. They’re happy just to let you find that out for yourself. 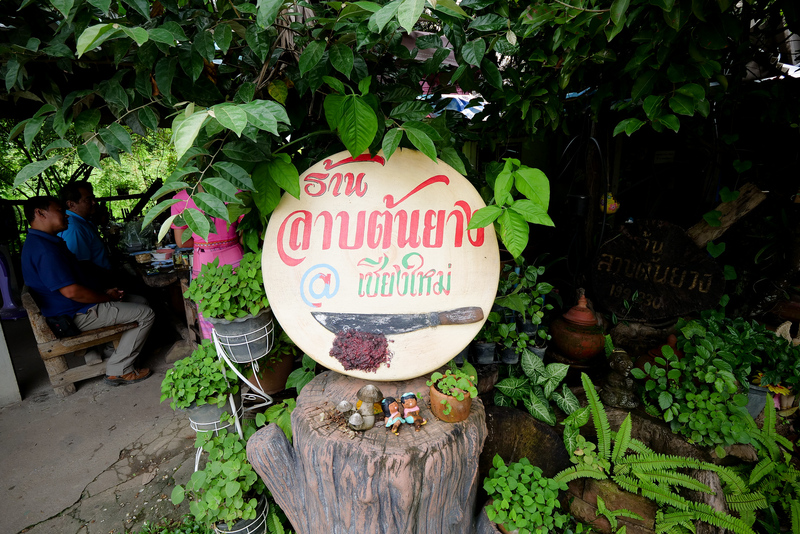 In this article I am going to share with you all the details of this authentic laap (ลาบ) restaurant in Chiang Mai, Thailand. 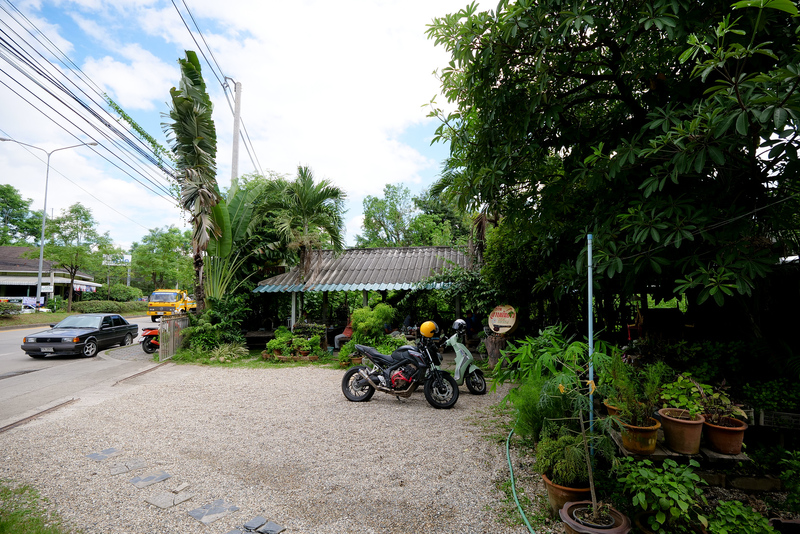 The restaurant is located on the way to Doi Saket, just outside the city center of Chiang Mai. 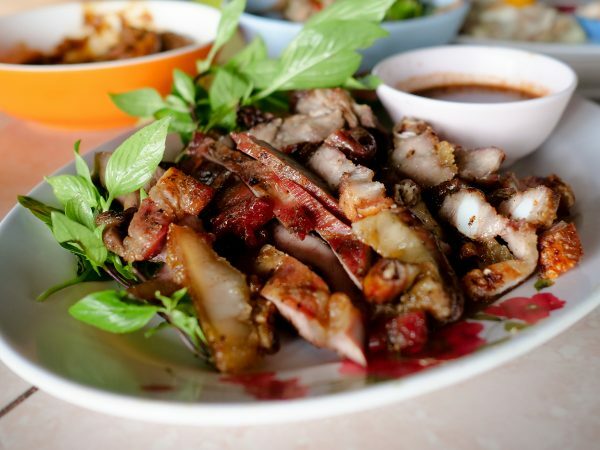 The name of the restaurant is simply ‘Laap Ton Yang (ร้านลาบต้นยาง)’ – which means chopped meat rubber tree in Thai – but “The Endless Possibilities of Laap” would be a name closer to the truth. If you haven’t already watched my video of lunch at this restaurant, be sure to check it out. You’ll find more info and details for how you can get to this restaurant the bottom of this post. For now though, lets get right to the dishes! 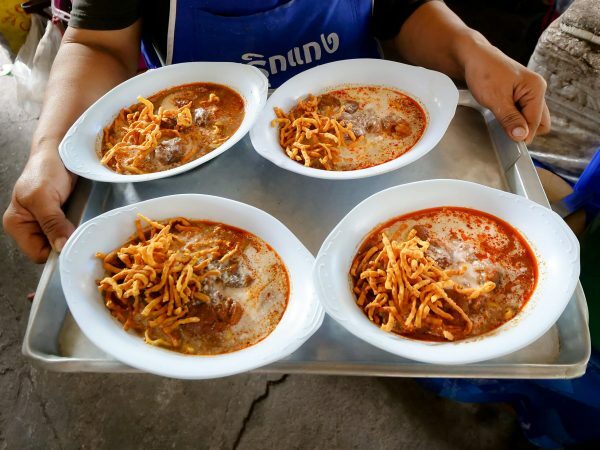 I have enjoyed many plates of laap during almost a decade of living in Thailand, and the laap recipes of Northern Thailand are some of my favorites. First dish we ordered was raw beef salad (ลาบเนื้อ ดิบ laap-neu-ah-dip). 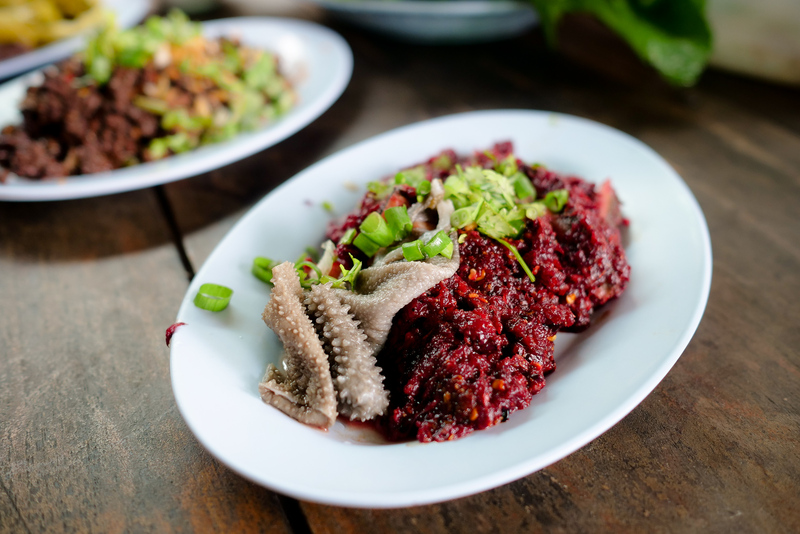 The raw beef version of laap, which in Thai is called laap neua dip (ลาบเนื้อ (ดิบ), served at Laap Ton Yang (ร้านลาบต้นยาง) restaurant has everything you want – consistency, texture, and flavor that is just out of control good. As a bonus here, when you order this dish, they also throw on a few lightly blanched thin strips of rumen. Rumen and omasum add great backdrops of chewiness to the creamy, rich consistency of this ultra-minced beef. I don’t think my appetite for Northern Thai-style Laap will ever diminish. Not even when I have five plates of it in a single day. I made sure to order several plates here, one of everything on Laap Ton Yang’s (ร้านลาบต้นยาง) daily special’s menu. Trust me when I say – this is a place you’re not going to want to miss. The non-raw version of laap is cooked in a sauce pan, not in oil, but sizzling in the fat of whatever animal meat is being used as the main ingredient. 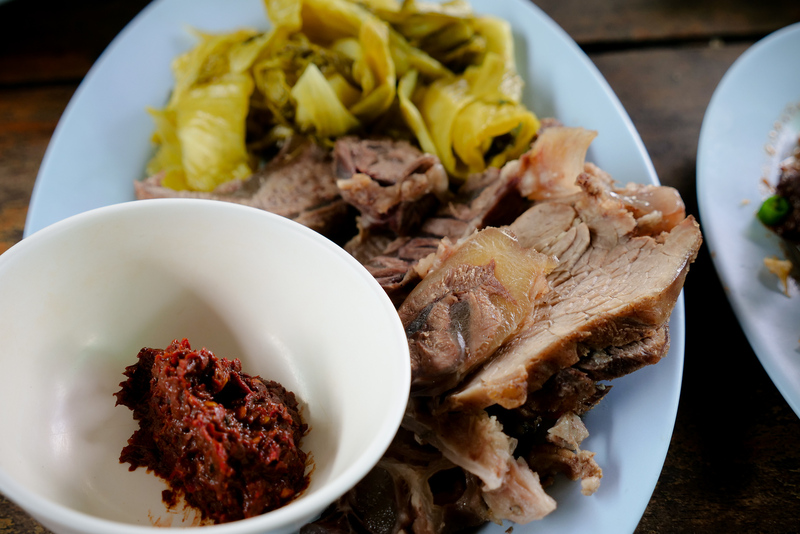 Our dish of cooked pork laap (ลาบหมู สุก laap moo sook) for this meal came dripping with pork fat and smoky oily flavor. Full of crispy fried shallots and mortar-pounded garlic, it was a complete umami-trifecta of goodness. This is the type of ‘salad’ that local country-side raw meat salad veterans are searching for. 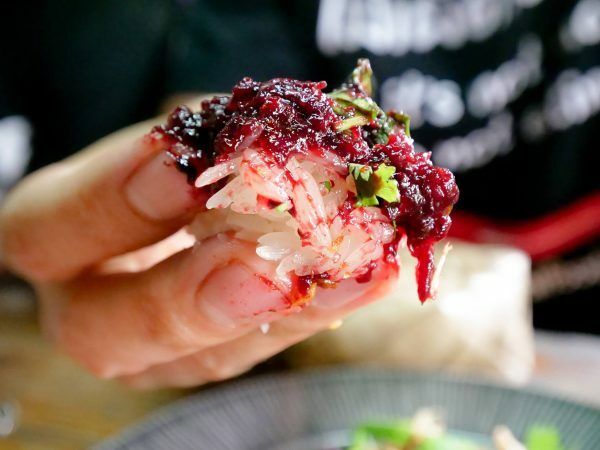 When the lunch-time hunger hits, you are bound to get bits of sticky rice flying around – and thats perfectly ok. I could taste ground nutmeg, coriander for sure, and maybe even a clove or cardamom. I love their totally authentic local recipe for laap, getting big doses of both home-pickled ma-kwen (a Northern-Thai berry similar to Szechuan peppercorns) and definitely the bitter flavors of cow bile. The serving temperature is quite cool, but the earthy spice blend they use gives this laap a powerfully warm feeling in each bite. Northern dry spices in the recipe here make it very unique from an Isaan style laap. 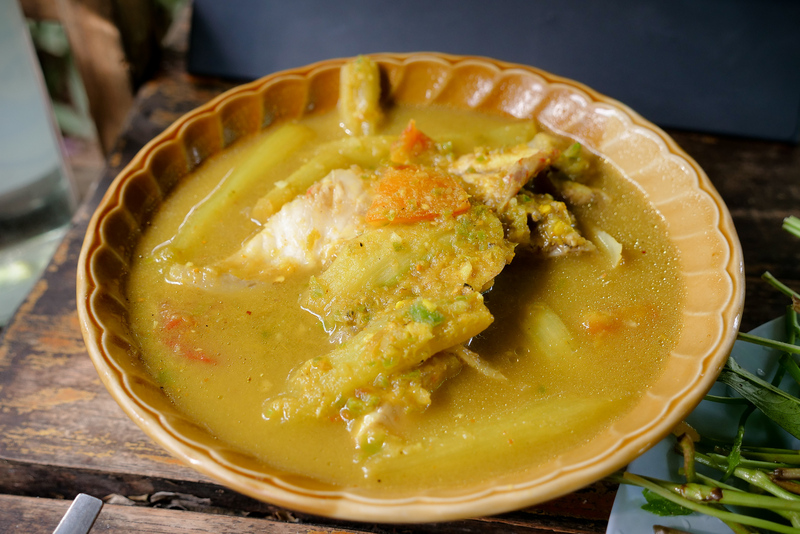 Even though these two dishes share a name, the ingredients of laap can vary widely by region. 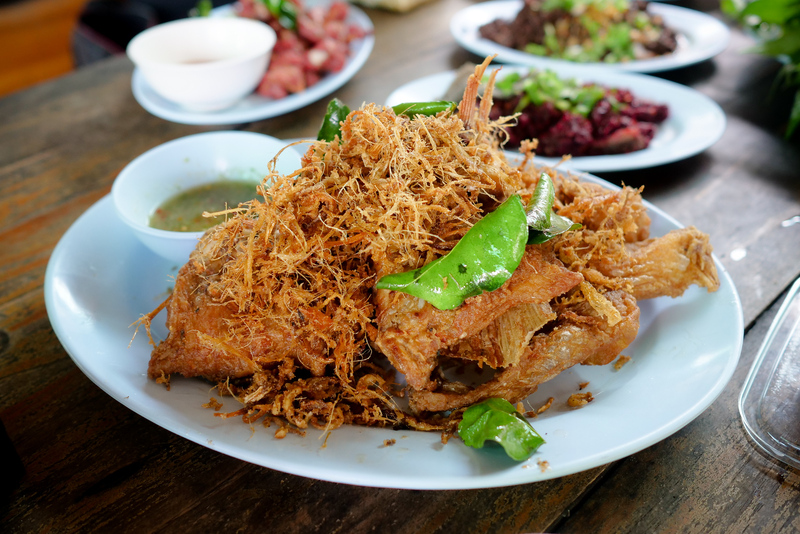 Laap Ton Yang Restaurant (ร้านลาบต้นยาง) has several dishes besides red meat, and the next thing we had to try here was the deep fried Tilapia fish with Thai herbs. It wasn’t the best dish we tried here, but it did make for a nice balance to the meal. Deep-fried in vegetable oil, it comes with the standard sour/spicy/salty Thai seafood dipping sauce. Huge chunks of fried fish meat, I thought this dish was great value for the price considering how much fish meat came on the plate. I preferred the fish without the seafood sauce, piling up instead a small mountain of deep fried lemongrass with every bite. Piping-hot oily fish meat together with that massive crunch lemongrass, the fish was a nice addition to a table nearly overflowing with beef and pork. Besides Raw mountains of Meat Salad, They also semi-cooked mountains as well. Besides the house specials, we also ordered a few other Northern dishes to try. 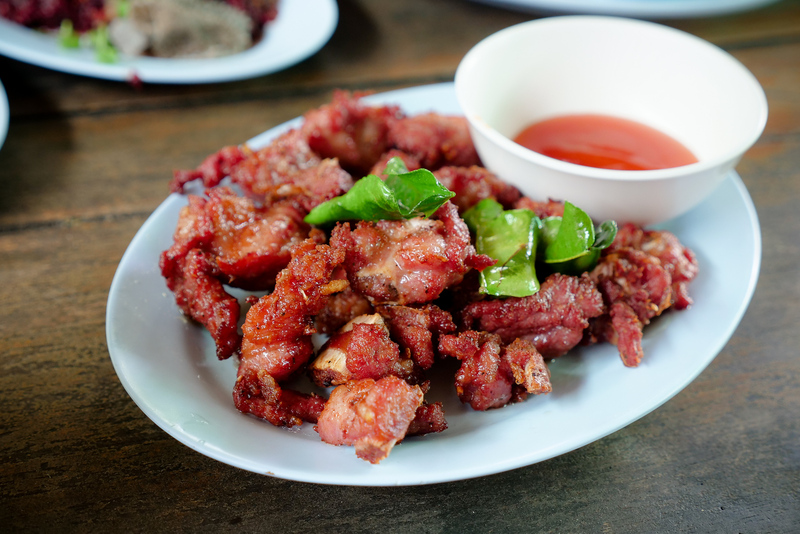 ‘Naem (แหนม)‘ is made when thick slices of raw pork meat are covered, and left to sit for a day, under the wonderful-yet-scorching rays of Thailand’s sun. This version of sun-soured pork ribs (แหนมซี่โครงหมูทอด naem see krohng moo tawd) at Laap Ton Yang (ร้านลาบต้นยาง) are dangerously tasty, salty, and really sour, deep fried to a crunchy goodness. This is one food that probably elicits a move to order beer, so be careful ordering it if you have anything else important to do today. These ribs definitely met the level of ‘guiltily-delicious treat,’ but I still think the absolute best fried pork ribs in Chiang Mai are at KumSangDao Restaurant (near Mae Rim). 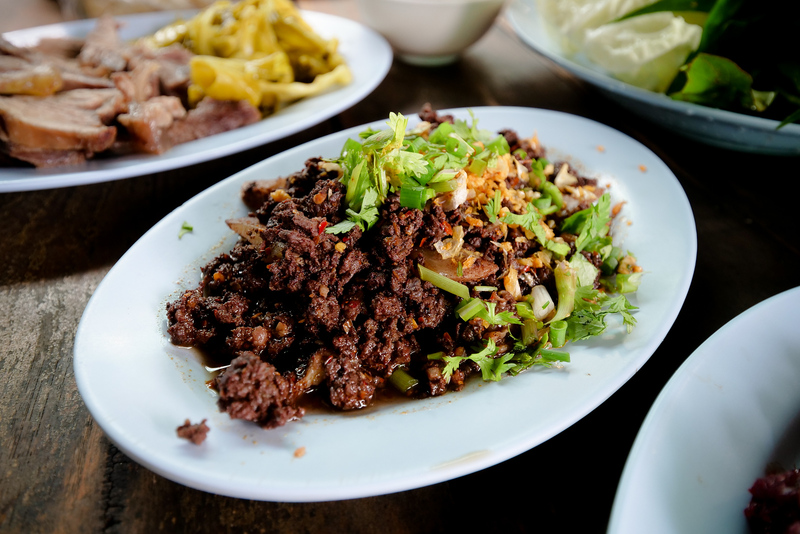 Another great beef dish here that we tried, and it comes with a great Northern-style chili paste (นำ้พริกตาแดง nahm prik da daeng), which in Thai means Red Eye chili paste. ‘Red-Eye’ paste has its name for good reason, chili paste is usually an ingredient for cooking, here its purely a dip. It will set you on fire in all kinds of wonderful ways. This dish seems to be the one on order for everyone else’s table as well today, and I even noticed a few tables finishing up, but then ordering this dish as take away, maybe continuing the lunch time feast while back at the office. You take a piece of the steamed beef, dip it into the chili paste, and enjoy. Last but not least, we also got a huge bowl of an interesting Northern Thai sour soup (แกงตูนป่า gaeng toon pa). 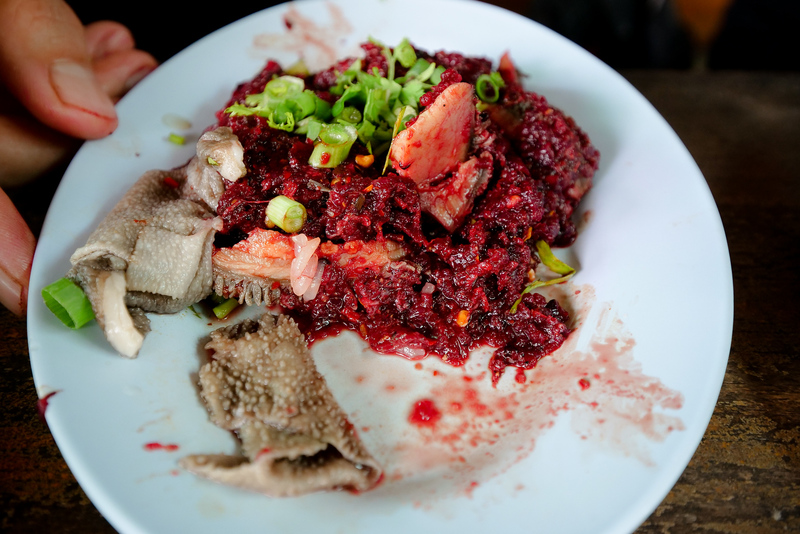 It has large chunks of soft fish meat, fibrous lotus roots, and a few stewed tomatoes. 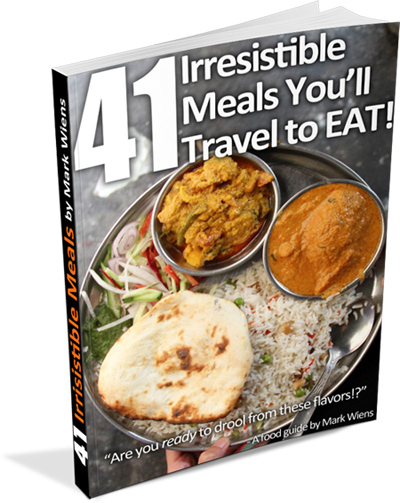 It was remarkably similar to Southern-style sour curry, that includes turmeric, chilies, and garlic – but after eating one spoon it was obviously unique, quite different, and a wonderful surprise. It did also remind me though of a jungle feast at one of my all-time favorite restaurants, Loong Riang and Pa Malee in Chonburi. Going back to work after a meat-heavy meal like this may be tough. If possible, I advise you to visit Laap Ton Yang (ร้านลาบต้นยาง) on an easy day, one where you can clear your schedule, and fully enjoy yourself. Laap Ton Yang (ร้านลาบต้นยาง) is a laid-back restaurant, where you can sit down and eat laap peacefully, unlike the intense competition for plates of Raw Buffalo at nearby the nearby local delight, Laap Ton Koi. If you love laap, then this is a restaurant you shouldn’t miss. Here are a few details for how to find it. I drove here (in a rental car straight from the airport for this trip, I’ve been using Europcar in Thailand), as I prefer traveling with my family. The name of the shop is “Laap Rubber Tree,” but you can look out for the more recognizable giant Fan Palm Tree in front. If you are using public transportation, Chiang Mai has quite a few of these red pick-up trucks (called “Rot Song-Taew”) running up and down all the main city roads. There were plenty of other things on the menu to try, and actually with their full-color photo menu you won’t need to speak any Thai even to order. 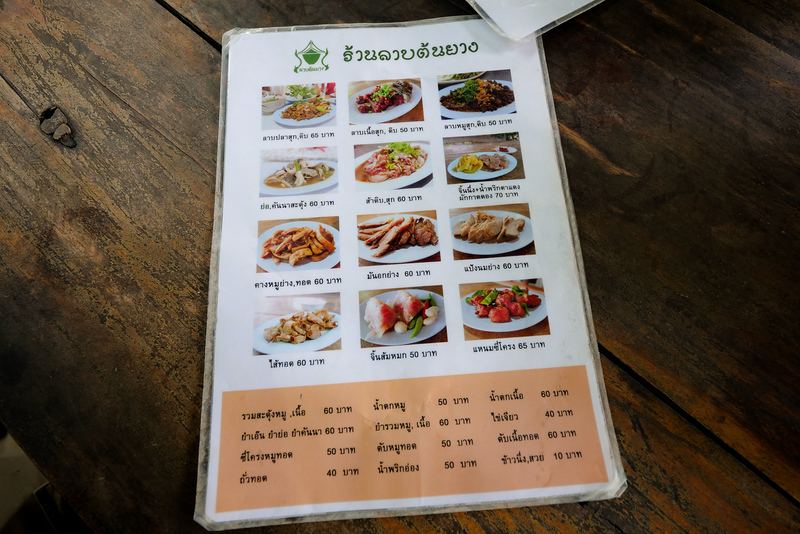 An amazing restaurant to eat a range of Northern Thai food in Chiang Mai, and some extremely satisfying plates of laap (ลาบ). Prices: Each normal dish of Laap is 50B, the larger dishes range from 70-90B. Quite good value for the large plates of meat they serve. Our total bill – 420 Baht (10B per plate of rice, 10B per bottle of water, and 5B for a bucket of ice). Wow!!! just came back from this place. It was all for me, as I was the only customer there. It was 1:55 when I arived. Nobody in sight and nobody came in!!!! I had a serving od two plates of your first two laab recommendations, the cooked pork salad (medium hot, perfect) and the raw beef salad. Amazing!!! Both of them. I was even more impressed with the cooked one. So flavorful. Then I went online and saw a picture of you and was taken aback. You’re very young. I thought you were an older dude… in his late 40s, maybe 50s. Anyway, keep em coming. Buffalo steak tartare is next… for sure. Just a heads up to let you know that I got three menus and none of them had the photo exposure you mention. One of them had it on the back, but it was faded, looked horrible and was unrecognizable, the colors just greyish-brown and no texture or color or brightness to them. Prices we re exactly as advertised. Hi Luis! Wow, thank you SO much for the awesome and in-depth reply to our recommendations. Yes, I can still have daydreams of those Laap salads now, thats a great restaurant. Sorry about the menu (I wonder if they provided us with the ‘foreigner-friendly’ menu without us knowing about it. Have a great day, thanks again for the message. For those inclined towards trying local food, the distinctive flavour combinations of these two styles of Northern style laap should be sampled at least once, for sure! The fish with the mound of fried lemongrass is an easy winner, I agree! It is incredibly difficult to get bored with eating Thai food, I mean look at that sour curry!